The big news this week is the release of Vegas Movie Studio 14. Generally speaking the release of a new version of any software is not really big news as such but this one is a little different. If we go back to the very beginnings of the software it started out as an audio editor created by a now defunct software company called Sonic Foundry. They eventually developed that original software into a video editing program which finally morphed into what we now know as Vegas Pro. Along the way Sonic Foundry were taken over by Sony resulting the Sony Creative Vegas line of products. Also along the way while under the Sony banner, a consumer level version was spun off resulting in what we now know as Movie Studio. So, why is this all important? Glad you asked! The original Vegas Pro was designed like most programs at that time on the basis of what a professional film editor would be doing in his or her daily work. This determined the workflow, the terminology, the overall layout of various sections and much of the functionality. Whilst it was great for professional editors moving to digital, for the average person just starting out in digital home movies it was a nightmare! This was partly why the consumer level spin off version happened but the problem was that the designers and developers had absolutely no idea about how to design a newbie friendly piece of software. To be blunt, what they did was take a complicated and bewildering piece of software (Vegas) and dumbed it down according to what they thought was something for the newcomer. The actual result they achieved was a dumbed down piece of bewildering and complicated software! It’s only saving grace was an onboard help system that was developed later which was designed to make learning the software easier. 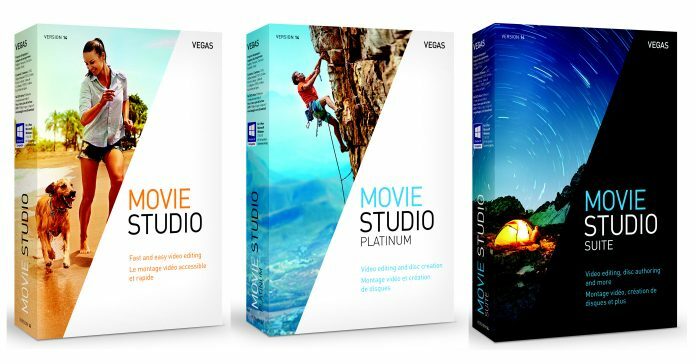 Finally last year the entire Vegas range including Movie Studio was bought out by the German based Magix company who have taken the whole range and placed it under the new Vegas Creative banner. The importance of all of this is that for the first time with the release of Vegas Movie Studio 14 the software has been updated and upgraded by a company (Magix) that actually knows what it is doing when it comes to consumer level editing software. In this latest release they have taken what was slowly becoming a dull and stale piece of software and breathed new life into it. I am currently about halfway through a review of it and so far I have say it is a much improved product. Magix have added a few things that have been standard at this level for a while now like multicam editing but the real difference is in the redesign of the interface into something that looks and functions so much better. The full review will be ready next week but in the meantime you can check out the new stuff at the Vegas Creative Website. When most people start to look at video editing for the first time it is usually because they have a bunch of footage they have taken and want to present it in some way. The variations on this are endless but that’s the basic gist of it. They are then subjected to a tsunami of marketing guff about the virtues of various video editing software products until eventually they make a choice on one of them. Their attitude at that point, based on the marketing, is that all they have to do is load some videos, maybe add some music and hey presto! Cinematic genius. Of course very soon after that they realize it’s not all quite how it was presented! From there they tend to stumble around until they reach the editing system most people operate under. This system involves adding all available footage onto the timeline in the sequence it was shot. Then go through that footage and cut out everything that looks bad including the 20 minutes of blackness from when the camera was put in a bag without realizing it was still running. Finally they add some music or even a little voice over and viola, all done! There is a section on this site called Basic Editing Tips which goes into all this at an introductory level but one point that is quite hard to explain is when to make a cut. Actually the real point is when, why and how to make a cut from one shot to the next or one scene to the next and yes, this does apply to simple projects just as much as Hollywood blockbusters. So regardless of what level you are operating at the video below is an excellent and quite concise round up of the why’s and wherefores of making cuts. Of course I couldn’t actually put out a Friday Roundup without at least one article on using light to shoot videos. Yes, I know I bang on about it endlessly but try shooting video with no light whatsoever and I don’t think you will get very far. By the way, for any smarties out there, infrared night shooting is still using light! So, do I expect anyone to use the following advice to the letter? But as always with “slightly pro” tips just an understanding of the concepts can really make a difference in your shots. Ah depth of field. We hear it all the time and simply put it is the depth of the image your are shooting that remains in focus in any given shot. Shallow depth of field means that the subject is in focus but the background is not. Long depth of field means both the subject and everything in the distant background are all in focus. So why do we use it and how does it affect our shots? Check out the video below for a very snappy explanation. There are lots of way to setup a camera and lights for shooting how to videos or talking head videos when you are the talking head! Unfortunately many of them seem to be quite complicated or require a level of equipment you and I are never going to invest in. The article below is a great resource for two very simple setups of shooting video that require very little in the way of equipment yet produce results good enough for the guy showing it to make commercially viable video courses.